J Unexplored Med Data 2017;2:52-9.10.20517/2572-8180.2017.12© The Author(s) 2017. 1Department of Cytobiology, Faculty of Pharmacy, Jagiellonian University Medical College, 30-688 Krakow, Poland. 2Department of Medical Diagnostic, Faculty of Pharmacy, Jagiellonian University Medical College, 30-688 Krakow, Poland. Treatment effectiveness in acute myeloid leukemia (AML) remains unsatisfactory because of frequent relapses and treatment-related problems in elderly patients (age > 65), in whom AML incidence is relatively high compared to that in younger people[1,2]. Therefore, researchers are still on a quest for new, more effective, and safer therapies for the treatment of AML, particularly in elderly patients in whom aggressive chemotherapy for leukemia may sometimes be impossible (e.g. due to age-related comorbidities). Polyphenols are natural phytochemicals, and some exhibit a chemopreventive effect as demonstrated in vitro and in vivo studies[3-6]. Some polyphenols can exert a cytotoxic effect in AML cells and curcumin, isolated from the rhizome Curcuma longa L. and with broad-spectrum anticancer properties, is an example. Curcumin not only inhibits multiple pathways on different levels that are often overexpressed in cancer cells but also sensitizes them to apoptosis; in cancer cells resistant to apoptosis, curcumin can induce an alternative cell death, such as a mitotic catastrophe[8-10]. Curcumin acts at the gene level and triggers many metabolic pathways[11,12]. It inhibits genes contributing to multidrug resistance and can modulate epigenetic phenomena by inhibiting the methyltransferase 1 in AML cells[13,14]. At present, intensive research efforts are directed toward leveraging the anticancer effect of curcumin and improving its bioavailability. Interest in this polyphenol is high, and the number of research efforts studying its anticancer activity is steadily increasing. Thus, curcumin has a potential role in the development of novel cancer treatments. Curcumin’s significant advantage is its low toxicity. Curcumin does not exhibit toxic effects in the human body even at doses of 9 g/kg b.w.[17,18]. Unfortunately, a major problem in the use of curcumin is its low bioavail-ability and rapid metabolism in plasma. To improve bioavailability and stability of the compound currently involves improving the methods for creating micro- and nanoparticles of curcumin, liposomes, micelles, and derivatives of curcumin[20-23]. The effectiveness of curcumin, however, can be potentiated simply by using a combination of the compound and other polyphenols. This constitutes one of the most natural ways to improve the efficiency of curcumin action, and effectively increase its bioavailability[24,25]. The use of curcumin in combination with other polyphenols may potentiate its effectiveness through synergistic interactions. Furthermore, cancer is a clonal disease, and individual clones of cells differ in sensitivity to chemotherapy and fall in mutual interactions. Therefore, therapeutic action directed at various molecular targets, such as those exhibited by curcumin, may be more effective than action directed towards only one of these targets. Combination therapy of curcumin with other polyphenols that act synergistically with curcumin may be an effective and safe addition to conventional chemotherapy, and may allow dose reduction of cytostatic drugs. This preliminary study was conducted to investigate the influence of a several flavonoid polyphenols on the cytogenotoxic activity of curcumin in a HL-60 myeloid leukemia cell line. Curcumin (80.1% purity), (-)-epicatechin, quercetin, fetal bovine serum (FBS), phosphate-buffered saline (PBS), ethanol, formaldehyde, dimethyl sulfoxide (DMSO), propidium iodide, and RNAse A were purchased from Sigma-Aldrich Co. (St Louis, MO, USA). RPMI 1640 medium was obtained from American Type Cell Culture (ATCC, UK). Primary rabbit monoclonal anti-γH2AX (Ser 139) and secondary anti-rabbit IgG (H+L) F(ab')2 fragment of goat antibody conjugated with Alexa Fluor 647 were purchased from Cell Signaling Technology, Inc. (Dallas, TX, USA). Cells of the HL-60 line obtained from the American Type Culture Collection (ATCC, European branch in UK) were cultured in RPMI-1640 medium supplemented with 10% FBS without antibiotics at 37 °C in a 5% CO2 and 95% humidified atmosphere. HL-60 cells were incubated in 24-well culture plates (0.4 × 106 cells/well) with different concentrations of polyphenols or combination treatments for 20 h. Polyphenols for evaluation were dissolved in DMSO (0.06% in the culture medium), whereas control cells were incubated only with DMSO. Propidium iodide staining was used to determine the cytotoxicity of the investigated polyphenols; cells were stained according to instructions that were developed and optimized by R&D Systems Flow Cytometry Laboratory. Briefly, after 24 h of incubation, the cells were washed (230 g, 5 min) and resuspended in 100 μL PBS; then 10 μL PI staining solution (10 μg/mL) was added. Cells were incubated for 1 min in the dark and, thereafter, the volume of the PBS was increased to 350 μL. The treated cells (at least 20,000 single cells) were immediately subjected to flow cytometric analysis. The half-maximal inhibitory concentration (IC50) and the combination index (CI) for HL-60 cells were calculated using CalcuSyn (Biosoft, Cambridge, UK). The CI was evaluated by the multiple drug-effect equation of Chou-Talalay; CI values less than 1 indicate synergism, those equal to 1 indicate an additive effect, and values greater than 1 indicate antagonism. Phosphorylated histone H2AX (γ-H2AX) was detected as a marker of DNA damage, mainly double-DNA strand breaks (DSBs). Briefly, the cells were fixed on ice with 1% methanol-free formaldehyde solution in PBS for 15 min and permeabilized with ice-cold 70% ethanol diluted in deionized water and added dropwise to the cells with stirring. The cells were incubated with ethanol for 24 h at -20 °C and then washed twice with 1% BSA in PBS. Next, HL-60 cells (0.4 × 106/well) were stained with primary rabbit monoclonal anti-γ-H2AX (Ser139) antibody for 2 h at room temperature, subsequently washed twice with 1% BSA in PBS, and then incubated with a secondary anti-rabbit immunoglobulin (Ig) G (H+L) F(ab')2 fragment of goat antibody conjugated with Alexa Fluor 647 for 30 min in the dark. Next, the cells were washed twice with 1% BSA in PBS. DNA was stained with PI and RNase A in PBS for 30 min at room temperature in the dark. An isotype control was set with the rabbit monoclonal IgG XP antibody. Then, cells were analyzed with a LSRII flow cytometer using red and blue lasers and 633-nm excitation for Alexa Fluor 647 (660/20 BP filter) and 488-nm excitation for PI/PE (575/26 BP filter). Cell doublets and debris were excluded from analysis using PI-width versus PI-area calculations, and at least 20,000 single cells were analyzed using an LSR II flow cytometer; quantitative analysis of γ-H2AX-positive cells was conducted using FACSDiva software (BD Biosciences Immunocytometry Systems). Test U Mann-Whitney and one-way analysis of variance (ANOVA) with the Tukey post hoc test were used to calculate the statistical significance between groups. All data are shown as mean ± standard error of the mean. The cytotoxic effects of investigated polyphenols were dependent on their concentrations. Among the tested polyphenols, curcumin exerted the most potent cytotoxic action in cells. This polyphenol was already cytotoxic at a concentration of 10 µmol/L (P < 0.001) as compared with the control [Figure 1]. In general, the investigated polyphenols can be sequentially ranked by cytotoxic activity as: curcumin > quercetin > epicatechin [Figures 1-3]. Each flavonoid in the study modified curcumin cytotoxic activity in HL-60 cells but in different ways. CI analysis showed that epicatechin most strongly modified the effect of curcumin among the tested flavonoids, wherein its mode of action depends closely on their concentrations. 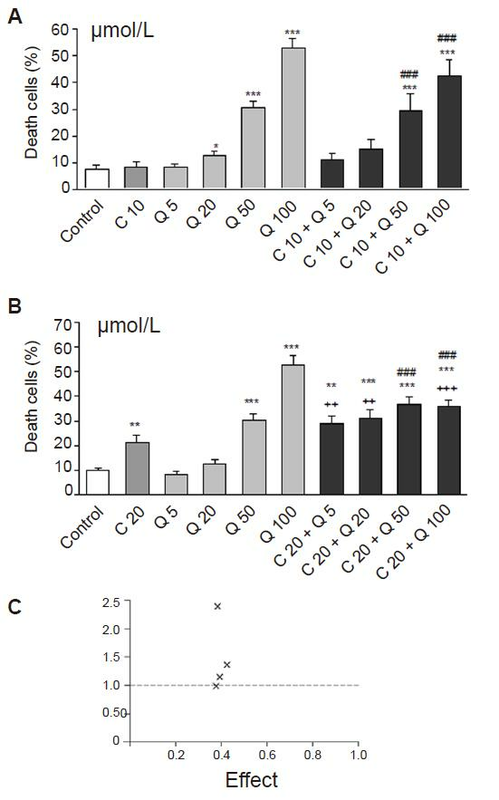 Lower concentrations of epicatechin in the range of 50-500 µmol/L synergistically intensified cytotoxic effects of curcumin (CI < 1, Figure 2C and D), whereas high concentrations (750 µmol/L and 1 mmol/L) acted antagonistically with curcumin (CI > 1, Figure 2C and D). 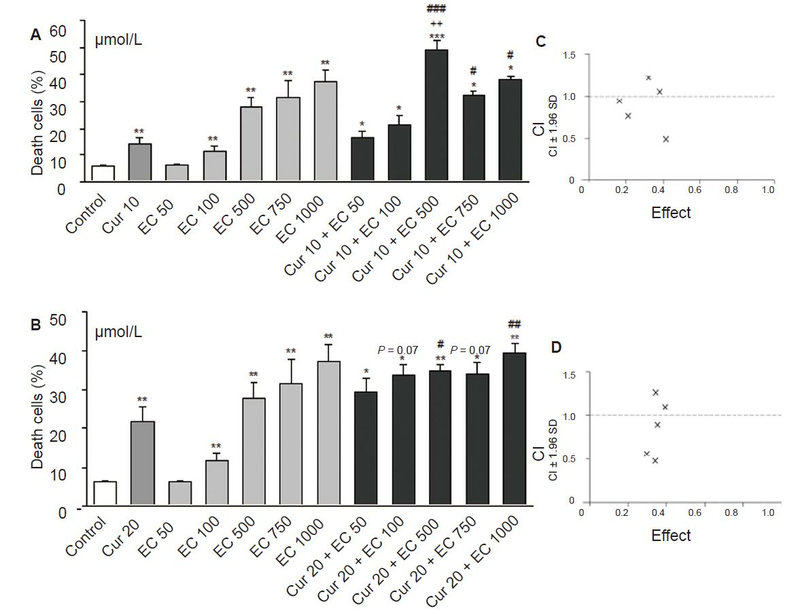 The biological significance of this synergism can only be expected with the combination of C10/C20 + EC500 µmol/L, whose cytotoxic effect is significant in comparison to curcumin [Figure 2A and B]. Quercetin exerted an additive effect only at the lowest applied concentration (5 µmol/L with 20 µmol/L curcumin, CI = 1, Figure 3C), but the difference between these groups was not significant [Figure 3B]. 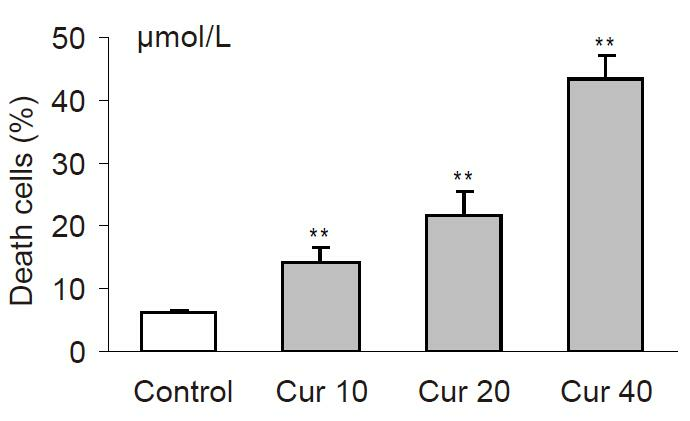 Higher concentrations of quercetin in the range of 20-100 µmol/L acted antagonistically with curcumin (CI > 1, Figure 3C). None of the investigated polyphenols had a significant effect on the level of γH2AX after 20-h incubation [Figure 4A]. The combination of curcumin 40 µmol/L and epicatechin 500 µmol/L significantly potentiated H2AX phosphorylation in comparison with controls [Figure 4A and B], suggesting that this combined effect induces DSBs. Among the investigated compounds, the strongest influence on the cell cycle was exerted by curcumin, which inhibited the cell cycle in the S phase, as evidenced by a significant increase in the percentage of cells in this phase of the cell cycle after curcumin treatment of HL-60 cells compared to the control (P < 0.05, Table 1). Consequently, curcumin significantly decreased the percentage of cells in the G1 and G2/M phases as compared to the control (P < 0.05, Table 1). Quercetin, among the polyphenols tested, exhibited the weakest effect on the cell cycle, significantly reducing the percentage of cells in phase G1 (P < 0.05, Table 1). Epicatechin induced a significant decrease in the percentage of cells in the S and G2/M phases [Table 1], indicating its potential for strong cytotoxic activity. The strongest effect on the level of sub-G1 apoptotic fraction was exerted by curcumin and epicatechin. The flavonoids we investigated did not significantly modify the effect of curcumin on cell cycle in HL-60 cells (data not shown). Polyphenols, such as quercetin and epicatechin and which are ubiquitous in edible plants, can variably modify curcumin cytotoxicity based on their therapeutic concentration in AML cell lines. In our own earlier studies, we have demonstrated a cytotoxic effect of curcumin in HL-60 cells that was mediated through a free-radical mechanism, because the use of N-acetyl-l-cysteine was protective against the cytotoxic effect of curcumin. Because polyphenols may be characterized by the opposite anti- or pro-oxidant activity, depending on the microenvironment of the cell[30-32], it may be assumed that both quercetin and epicatechin can modify the action of curcumin by affecting the oxidative state. In addition, HL-60 cells are characterized by high myeloperoxidase (MPO) activity. Polyphenols comprising a catechol group, such as epicatechin or quercetin, or with a β-diketone structure, such as curcumin, may exert a prooxidative effect, increase the production of 8-hydroxy-2’deoxyguanosine (8-OHdG), and induce apoptosis in the presence of elevated Cu2+ concentration, as is the case in cancer cells[34-36]. Polyphenols reduce Cu2+ to Cu+ ions, which then react with oxygen to contribute to an increase in H2O2, which is essential for the induction of apoptosis by MPO. Furthermore, MPO activity is high in HL-60 cells. Khan et al. found that the use of neocuproine, a chelator of Cu2+ ions, inhibits polyphenol-induced apoptosis in cancer cell lines. In the present study, epicatechin most effectively increased the cytotoxic effect of curcumin - a synergistic effect of both compounds that was not observed in combination with other polyphenols and curcumin. Previous studies have demonstrated that epicatechin is subject to single-electron oxidation, with MPO activity leading to increased H2O2 production, with a resultant increase in the level of DNA damage in HL-60 cells. In other studies, epicatechin was shown to be a very good electron donor for various heme peroxidases and was preferentially oxidized in the presence of other substrates of MPO. Considering these facts, epicatechin can potentiate curcumin cytotoxicity in HL-60 cells through a free-radical mechanism. However, epicatechin potentiated the effect of curcumin at lower concentrations, whereas high concentrations of the flavonoid acted antagonistically with curcumin. Our results are consistent with those reported from other studies of cytotoxic effects from a combination of different polyphenols, which often depend on the type of interaction and concentration of compounds. Among the investigated polyphenols, epicatechin has been identified as a potential candidate for further research to improve curcumin cytotoxicity in vivo because the compound acts synergistically with curcumin. This synergistic effect of epicatechin and curcumin was also observed by Saha et al. in human lung carcinoma PC-9 and A549 cell lines. Epicatechin potentiated the inhibition of growth and apoptosis induced by curcumin in these cells. The authors suggest this synergism is responsible for the increased curcumin bioavailability when administered in combination with epicatechin, because they showed increase in intracellular concentrations of curcumin in cells incubated simultaneously with epicatechin. Similarly, Ghosh et al. showed that curcumin and epigallocatechin gallate (EGCG), when sequentially added to the medium, act synergistically in chronic lymphocytic leukemia (CLL) cells. We gathered interesting data by analyzing the levels of phosphorylated H2AX -- a marker of DNA DSBs. The investigated polyphenols did not increase phosphorylation of H2AX even at concentrations that caused significant cytotoxicity. In contrast, a combination of curcumin and epicatechin significantly increased the level of γH2AX. Therefore, the increase in genotoxicity induced by a combination of polyphenols underlies their cytotoxic activity in HL-60 cells. This effect is interesting because such genotoxicity is characteristic of conventional cytostatic drugs. Further research should be designed to evaluate whether the combination of curcumin and epicatechin induce genotoxic effects in normal cells. However, considering that many studies confirm a more selective cytotoxic effect of polyphenols in cancer cells as compared to conventional anticancer drugs, the combination of curcumin and epicatechin will have a dual cytogenotoxic impact in leukemic cells but a weaker effect in normal cells. In addition, we have observed such selective genotoxic activity of epicatechin in leukemic cells as compared to normal cells, in our comparative research study in a acute myeloid leukemia BNML rat model and healthy rats of the same line. 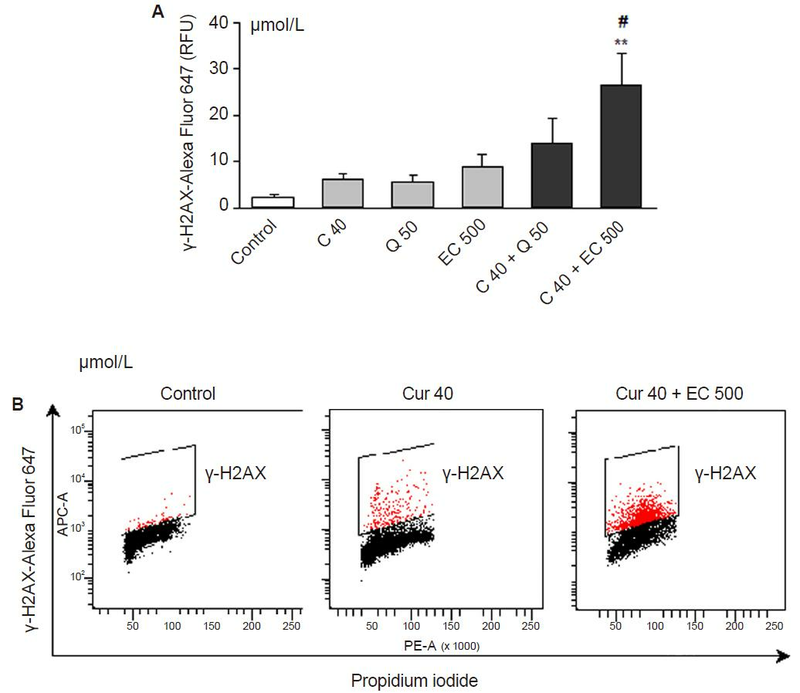 In our experiments only epicatechin potentiated the phosphorylation of H2AX in combination with curcumin. Simultaneous treatment of HL-60 cells with quercetin and curcumin did not exert a significant genotoxic effect. Thus, the mechanism of action of the latter combination of polyphenols is different from the combined effect of curcumin and epicatechin. Although these studies used relatively high concentrations of polyphenols, it cannot be overlooked that they will work similarly in vivo. Findings have shown that high concentrations of polyphenols during short in vitro incubation periods induce effects similar to those attained in long-term cell cultures in the presence of low concentrations of polyphenols that have been detected in body fluids. Given the fact that the type of interaction between polyphenols is multifactorial, including not only the structure but also drug concentration and cell microenvironment, caution is required with using supplementation complexes of polyphenols, as their effects may be difficult to predict. From the results obtained, a combination of curcumin and epicatechin may be the subject of further study in animal models to determine doses that can exert significant effects in leukemia cells in vivo. The study was supported by the Jagiellonian University Programs No. K/ZDS/006215. Experiments were performed on commercial HL-60 cell line. In accordance with the guidelines of the Bioethics Committee of the Jagiellonian University, ethics approval is not required on cells purchased in the company. 1. Eleni LD, Nicholas ZC, Alexandros S. Challenges in treating older patients with acute myeloid leukemia. J Oncol 2010;2010:943823. 2. Löwenberg B, Griffin JD, Tallman MS. Acute myeloid leukemia and acute promyelocytic leukemia. Hematology Am Soc Hematol Educ Program 2003:82-101. 3. Schwarz D, Roots I. In vitro assessment of inhibition by natural polyphenols of metabolic activation of procarcinogens by human CYP1A1. Biochem Biophys Res Commun 2003;303:902-7. 4. Pellecchia M, Reed JC. Inhibition of anti-apoptotic Bcl-2 family proteins by natural polyphenols: new avenues for cancer chemoprevention and chemotherapy. Curr Pharm Des 2004;10:1387-98. 5. Garg AK, Buchholz TA, Aggarwal BB. Chemosensitization and radiosensitization of tumors by plant polyphenols. Antioxid Redox Signal 2005;7:1630-47. 6. D'Alessandro T, Prasain J, Benton MR, Botting N, Moore R, Darley-Usmar V, Patel R, Barnes S. Polyphenols, inflammatory response, and cancer prevention: chlorination of isoflavones by human neutrophils. J Nutr 2003;133:3773-7S. 7. Pesakhov S, Khanin M, Studzinski GP, Danilenko M. Distinct combinatorial effects of the plant polyphenols curcumin, carnosic acid, and silibinin on proliferation and apoptosis in acute myeloid leukemia cells. Nutr Cancer 2010;62:811-24. 8. Ravindran J, Prasad S, Aggarwal BB. Curcumin and cancer cells: how many ways can curry kill tumor cells selectively? AAPS J 2009;11:495-510. 9. Goel A, Aggarwal BB. Curcumin, the golden spice from Indian saffron, is a chemosensitizer and radiosensitizer for tumors and chemoprotector and radioprotector for normal organs. Nutr Cancer 2010;62:919-30. 10. Wolanin K, Magalska A, Mosieniak G, Klinger R, McKenna S, Vejda S, Sikora E, Piwocka K. Curcumin affects components of the chromosomal passenger complex and induces mitotic catastrophe in apoptosis-resistant Bcr-Abl-expressing cells. Mol Cancer Res 2006;4:457-69. 11. Zhang JR, Lu F, Lu T, Dong WH, Li P, Liu N, Ma DX, Ji CY. Inactivation of FoxM1 transcription factor contributes to curcumin-induced inhibition of survival, angiogenesis, and chemosensitivity in acute myeloid leukemia cells. J Mol Med (Berl) 2014;92:1319-30. 12. Sharma V, Jha AK, Kumar A, Bhatnagar A, Narayan G, Kaur J. Curcumin-mediated reversal of p15 gene promoter methylation: implication in anti-neoplastic action against acute lymphoid leukaemia cell line. Folia Biol (Praha) 2015;61:81-9. 13. Shah K, Mirza S, Desai U, Jain N, Rawal R. Synergism of curcumin and cytarabine in the down regulation of multi-drug resistance genes in acute myeloid leukemia. Anticancer Agents Med Chem 2016;16:128-35. 14. Yu J, Peng Y, Wu LC, Xie Z, Deng Y, Hughes T, He S, Mo X, Chiu M, Wang QE, He X, Liu S, Grever MR, Chan KK, Liu Z. Curcumin down-regulates DNA methyltransferase 1 and plays an anti-leukemic role in acute myeloid leukemia. PLoS One 2013;8:e55934. 15. Hussain Z, Thu HE, Ng SF, Khan S, Katas H. Nanoencapsulation, an efficient and promising approach to maximize wound healing efficacy of curcumin: A review of new trends and state-of-the-art. Colloids Surf B Biointerfaces 2017;150:223-41. 17. Dhillon N, Aggarwal BB, Newman RA, Wolff RA, Kunnumakkara AB, Abbruzzese JL, Ng CS, Badmaev V, Kurzrock R. Phase II trial of curcumin in patients with advanced pancreatic cancer. Clin Cancer Res 2008;14:4491-9. 18. Bayet-Robert M, Kwiatkowski F, Leheurteur M, Gachon F, Planchat E, Abrial C, Mouret-Reynier MA, Durano X, Barthomeuf C, Chollet P. Phase I dose escalation trial of docetaxel plus curcumin in patients with advanced and metastatic breast cancer. Cancer Biol Ther 2010;9:8-14. 19. Ireson CR, Jones DJ, Orr S, Coughtrie MW, Boocock DJ, Williams ML, Farmer PB, Steward WP, Gescher AJ. Metabolism of the cancer chemopreventive agent curcumin in human and rat intestine. Cancer Epidemiol Biomarkers Prev 2002;11:105-11. 20. Kheiri Manjili H, Ghasemi P, Malvandi H, Mousavi MS, Attari E, Danafar H. Pharmacokinetics and in vivo delivery of curcumin by copolymeric mPEG-PCL micelles. Eur J Pharm Biopharm 2017;116:17-30. 21. Chen FP, Ou SY, Tang CH. Core-shell soy protein-soy polysaccharide complex (Nano) particles as carriers for improved stability and sustained release of curcumin. J Agric Food Chem 2016;64:5053-9. 22. Amirthalingam M, Kasinathan N, Amuthan A, Mutalik S, Sreenivasa Reddy M, Nayanabhirama U. Bioactive PLGA-curcumin microparticle-embedded chitosan scaffold: in vitro and in vivo evaluation. Artif Cells Nanomed Biotechnol 2017;45:233-41. 23. Yan J, Wang Y, Zhang X, Liu S, Tian C, Wang H. Targeted nanomedicine for prostate cancer therapy: docetaxel and curcumin co-encapsulated lipid-polymer hybrid nanoparticles for the enhanced anti-tumor activity in vitro and in vivo. Drug Deliv 2016;23:1757-62. 24. Kale A, Gawande S, Kotwal S, Netke S, Roomi W, Ivanov V, Niedzwiecki A, Rath M. Studies on the effects of oral administration of nutrient mixture, quercetin and red onions on the bioavailability of epigallocatechin gallate from green tea extract. Phytother Res 2010;24 Suppl 1:S48-55. 25. Portincasa P, Bonfrate L, Scribano ML, Kohn A, Caporaso N, Festi D, Campanale MC, Di Rienzo T, Guarino M, Taddia M, Fofli MV, Grimaldi M, Gasbarrini A. Curcumin and fennel essential oil improve symptoms and quality of life in patients with irritable bowel syndrome. J Gastrointestin Liver Dis 2016;25:151-7. 26. Pesakhov S, Khanin M, Studzinski GP, Danilenko M. Distinct combinatorial effects of the plant polyphenols curcumin, carnosic acid and silibinin on proliferation and apoptosis in acute myeloid leukemia cells. Nutr Cancer 2010;62:811-24. 27. Hanahan D, Weinberg RA. Hallmarks of cancer: the next generation. Cell 2011;144:646-74. 28. Chou TC, Talalay P. Analysis of combined drug effects: a new look at a very old problem. Trends Pharmacol Sci 1983;4:450-4. 29. Papież MA, Krzyściak W, Szade K, Bukowska-Straková K, Kozakowska M, Hajduk K, Bystrowska B, Dulak J, Józkowicz A. Curcumin enhances the cytogenotoxic effect of etoposide in leukemia cells through induction of reactive oxygen species. Drug Des Devel Ther 2016;10:557-70. 30. Feng R, Ni HM, Wang SY, Tourkova IL, Shurin MR, Harada H, Yin XM. Cyanidin-3-rutinoside, a natural polyphenol antioxidant, selectively kills leukemic cells by induction of oxidative stress. J Biol Chem 2007;282:13468-76. 31. Papiez MA, Bukowska-Straková K, Krzysciak W, Baran J. (-)-Epicatechin enhances etoposide-induced antileukaemic effect in rats with acute myeloid leukaemia. Anticancer Res 2012;32:2905-13. 32. Papiez MA. The influence of curcumin and (-)-epicatechin on the genotoxicity and myelosuppression induced by etoposide in bone marrow cells of male rats. Drug Chem Toxicol 2013;36:93-101. 33. Cao G, Sofic E, Prior RL. Antioxidant and prooxidant behavior of flavonoids: structure-activity relationships. Free Radic Biol Med 1997;22:749-60. 34. Yoshino M, Haneda M, Naruse M, Htay HH, Tsubouchi R, Qiao SL, Li WH, Murakami K, Yokochi T. Prooxidant activity of curcumin: copper-dependent formation of 8-hydroxy-20-deoxyguanosine in DNA and induction of apoptotic cell Heath. Toxicol In Vitro 2004;18:783-9. 35. Oikawa S, Furukawa A, Asada H, Hirakawa K, Kawanishi S. Catechins induce oxidative damage to cellular and isolated DNA through the generation of reactive oxygen species. Free Radic Res 2003;37:881-90. 36. Nakazato T, Ito K, Miyakawa Y, Kinjo K, Yamada T, Hozumi N, Ikeda Y, Kizaki M. Catechin, a green tea component, rapidly induces apoptosis of myeloid leukemic cells via modulation of reactive oxygen species production in vitro and inhibits tumor growth in vivo. Haematologica 2005;90:317-25. 37. Wagner BA, Buettner GR, Oberley LW, Darby CJ, Burns CP. Myeloperoxidase is involved in H2O2-induced apoptosis of HL-60 human leukemia cells. J Biol Chem 2000;275:22461-9. 38. Khan HY, Zubair H, Faisal M, Ullah MF, Farhan M, Sarkar FH, Ahmad A, Hadi SM. Plant polyphenol induced cell death in human cancer cells involves mobilization of intracellular copper ions and reactive oxygen species generation: A mechanism for cancer chemopreventive action. Mol Nutr Food Res 2014;58:437-46. 39. Spalteholz H, Furtmüller PG, Jakopitsch C, Obinger C, Schewe T, Sies H, Arnhold J. Kinetic evidence for rapid oxidation of (-)-epicatechin by human myeloperoxidase. Biochem Biophys Res Commun 2008;371:810-3. 40. Saha A, Kuzuhara T, Echigo N, Suganuma M, Fujiki H. New role of (-)-epicatechin in enhancing the induction of growth inhibition and apoptosis in human lung cancer cells by curcumin. Cancer Prev Res 2010;3:953-62. 41. Ghosh AK, Kay NE, Secreto CR, Shanafelt TD. Curcumin inhibits prosurvival pathways in chronic lymphocytic leukemia B cells and may overcome their stromal protection in combination with EGCG. Clin Cancer Res 2009;15:1250-8. 42. Nawab A, Thakur VS, Yunus M, Ali Mahdi A, Gupta S. Selective cell cycle arrest and induction of apoptosis in human prostate cancer cells by a polyphenol-rich extract of Solanum nigrum. Int J Mol Med 2012;29:277-84. 43. Papiez MA, Baran J, Bukowska-Straková K, Wiczkowski W. Antileukemic action of (-)-epicatechin in the spleen of rats with acute myeloid leukemia. Food Chem Toxicol 2010;48:3391-7. 44. Moiseeva EP, Almeida GM, Jones GD, Manson MM. Extended treatment with physiologic concentrations of dietary phytochemicals results in altered gene expression, reduced growth, and apoptosis of cancer cells. Mol Cancer Ther 2007;6:3071-9.